When I made the decision to go forward with gasification stove project RLS Energy was one of the organizations that I spoke to while I was doing my research. They were very accommodating in answering all of my questions along with making recommendations on the direction, and the type of unit that I should consider. After reviewing the data and information, we placed an order with them for a Heatmaster G200. I chose to do a “DIY” installation on this project. RLS Energy offered me all the support necessary to make this a successful project from start to finish, which was greatly appreciated. After completing the installation phase, Rob gave me comprehensive instruction on the operation, care, and maintenance of our unit. In my book one of the real testaments of a great supplier is support after the sale, and RLS Energy did exactly that. After the first winter of operation I had shut the unit down in-preperation for cleaning and noticed a small water leak inside of the fire box. I contacted RLS Energy, and Rob immediately responded. He came over and together we reviewed the condition. He took photographs, and made contact with the Manufacturer in a very timely fashion, and was able to make arraignments for getting the condition corrected very quickly. That was very much appreciated by myself, for a job well done! In summary, I have been extremely pleased with the service and support that we have received from RLS Energy, and would highly recommend them to anyone for their energy equipment needs! RLS Energy installed a 10 kW PV system for us a year ago to the day and it has produced over 14,000 kWh! The system consists of two ground mounted tilting racks holding twenty 250 W panels each and two 5 kW inverters. The entire installation is professional, right down to the lawn graded away from the foundation. Not only has the system outperformed, but the bid was the lowest of three, beating the highest bid by 48%. I originally projected an 11-year payoff, but now its looking more like eight years. I was so impressed with the work last year that I brought RLS Energy back to help design and install a roof-mounted rack system for a five-panel solar hot water system I’m rebuilding. Rob worked with me, providing equipment and labor for a fair price where needed without pressure to do the entire project. Rob and his workers took on my projects as their own. I found them to be engaged and focused on doing things fairly and correctly at a reasonable cost. Their innovation showed up in many small things that made the projects fit my home. Their mission is to provide green energy that lasts and their work is evidence of that. Thanks for your good work, Rob! Thank you for your response. Although I was disappointed with the result, I respect greatly the fact that you didn’t try to “sell” me something that wouldn’t meet my needs at this time. It’s clear to me that you have great integrity and are used to dealing with people in an honest way. I really admire and appreciate that. I would like to continue the “my use of greener energy solutions” conversation in the future. If I choose to make any energy changes be assured that you will be the first person I call. It was a delight to talk to you when you and your wife came to Arcadia, and it has been a quality experience dealing with you concerning my use of solar energy. In 1984 I purchased a roof fixed-mount solar system from Sunway Builders. That was the last year solar tax credits were available to homeowners. Since then Sunway Builders has gone out of business and service for my system went with them. I have since learned enough about the system to replace some parts which allowed it to limp along until I contacted Rob Sepeter of RLS Energy. He immediately showed interest in having my system work as it was designed. Through countless hours of his own time he has developed, made recommendations, and revived my non-working solar system into an efficient and working entity. 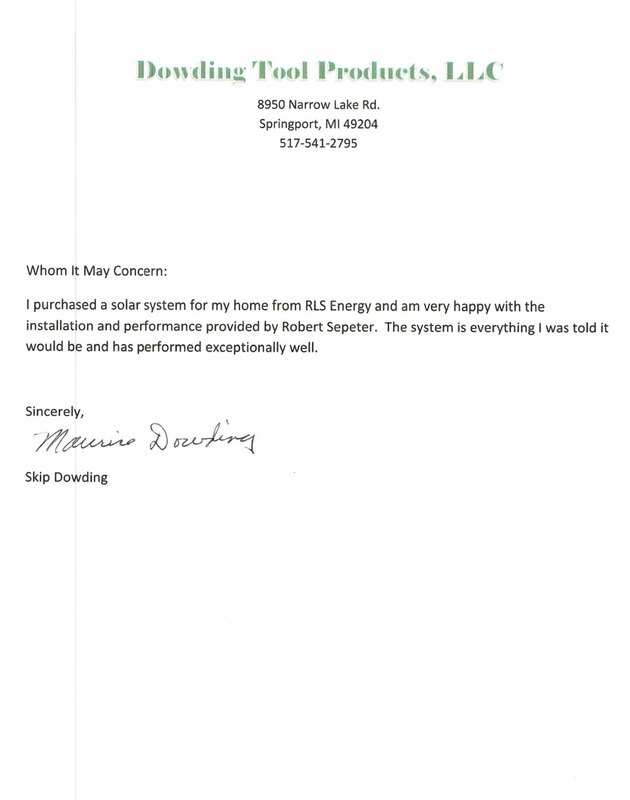 I am grateful for this effort and as a result, am recommending Rob to anyone who has solar system problems. I’m very appreciative of the good work that you and your team have done in the last several days. You covered every detail and put together a system that both of us can be proud of. I keep looking for Consumer’s monthly bill that usually comes around this time of the month. Last month we used 872 kWh, which runs around 30 kWh a day. If I can average around 10 kWh each day, that will be fine. Right now in these summer months, my average is around 16 kWh. We can keep the road signs up until winter and hope others will join you in making a better world to live in. Best wishes toward more good work in the future!! Rob put in a 10 kWh wind turbine and also a 10.9 kWh solar system for me. Both projects were performed exactly as he presented them! I would highly recommend him to install such units for anyone.